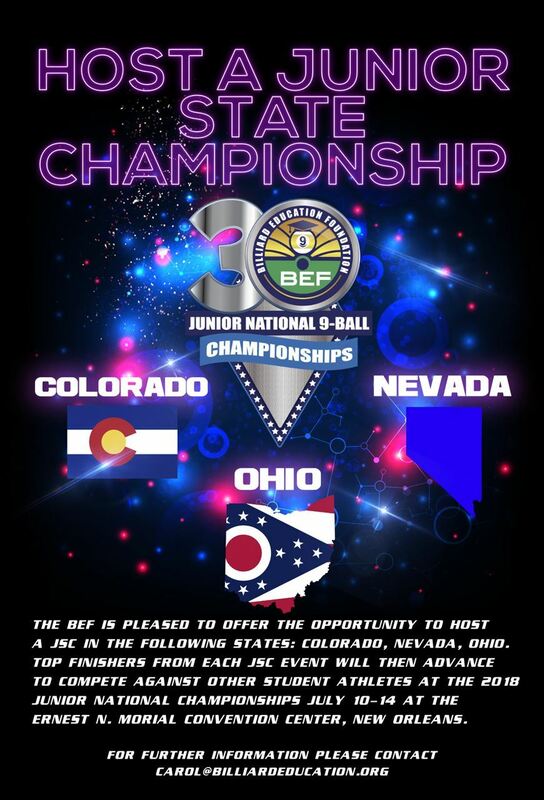 The BEF Junior Nationals is the most prestigious youth billiard event in North America. Celebrating its 30th anniversary, this year’s event will be held July 10-14, 2018 at the New Orleans Convention Center in New Orleans, LA. Top young cueists will compete for academic scholarships, prizes, and an opportunity to represent North America at the World Pool-Billiard Association (WPA) World Junior 9-Ball Championships. Junior State Championships (JSC) are held nationwide and we encourage you to participate as a host site. Please submit your applications to host a JSC by May 16, 2018. For over 3 decades, young billiard student-athletes from all over the country compete in local qualifiers for their chance at this prestigious title, scholarship dollars, and prizes. It’s the only junior event in the U.S. that qualifies young players to compete at the WPA (World Pool-Billiard Association) World Junior 9-Ball Championships. Between junior leagues, qualifiers and the Junior State Championship program, the BEF is anticipating its largest participation this year. The national championships boast 8 divisions: 18 & Under Boys, 16 & Under Boys, 14 & Under Boys, 11 & Under Boys (non-world-qualifying division), 18 & Under Girls, 16 & Under Girls, 14 & Under Girls, and 11 & Under Girls (non-world-qualifying division). The three upper age divisions for both boys and girls will also all be World Qualifiers. Those matches will be played on 20 each, 9' Diamonds. Deadline to register is June 30, 2018. The Billiard Education Foundation (BEF) was formed in 1993 as a 501(c)(3) non-profit charity committed to promoting a lifelong love of pool and building the next generation of players through youth programs and academic scholarships. The BEF also sanctions Junior State Championships, produces the annual Junior National 9- Ball Championships and qualifies young players each year for the WPA World Junior Championships. More exciting details to come. So be sure to mark these dates on your calendar. We will be back with more news soon! BUILDING THE NEXT GENERATION OF BILLIARD PLAYERS. The 30th Annual BEF Junior Nationals to be Held at Ernest N. Morial Convention Center in New Orleans July 10-14, 2018. 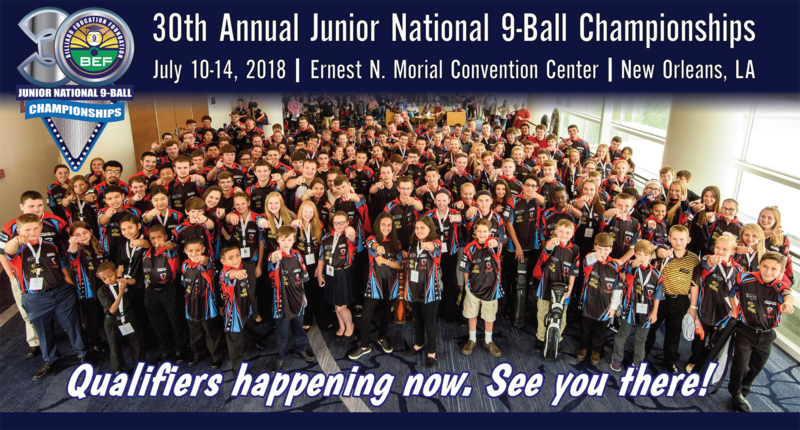 The Billiard Education Foundation (BEF) is thrilled to announce its 30th Annual Junior National 9-Ball Championships (JNC) to be held July 10-14, 2018 at the Ernest N. Morial Convention Center in New Orleans, LA. Junior State Championships and qualifiers are being held across the country for the youth to earn their chance to compete at the JNC. Visit www.billiardeducation.org or call (303) 926-1039 if interested in hosting a State Championship or qualifier. 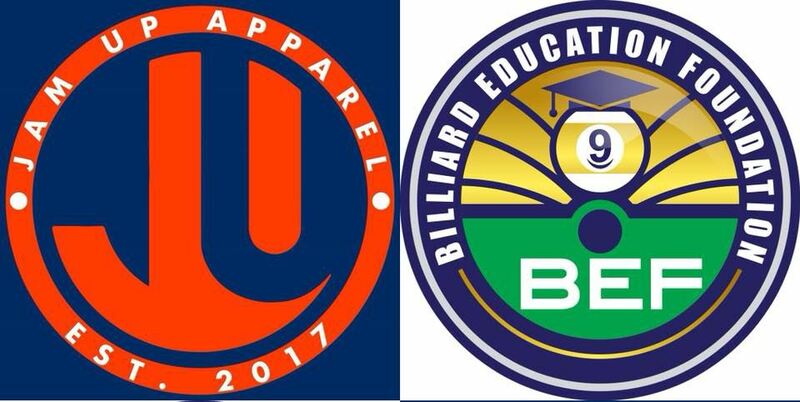 We are excited to announce that Jam Up Apparel will be partnering with the Billiard Education Foundation. With every order a portion of the proceeds will go to the BEF for scholarships and other needs of the foundation. Jam Up Apparel was started by lifelong friends Damian Pongpanik and Damian Alishan who aside from sharing a first name, also share an incredible passion for the precise discipline that is world class pool. Having spent several years traveling the country and competing on some of the sport’s biggest stages and most infamous backrooms, the respect they both have for the game has now transcended into their clothing brand Jam Up. Hoping to give the pool community a brand that not only can they embrace as their own but one that also fits the individual player’s need for comfort, style, and the constant chase for pool perfection. 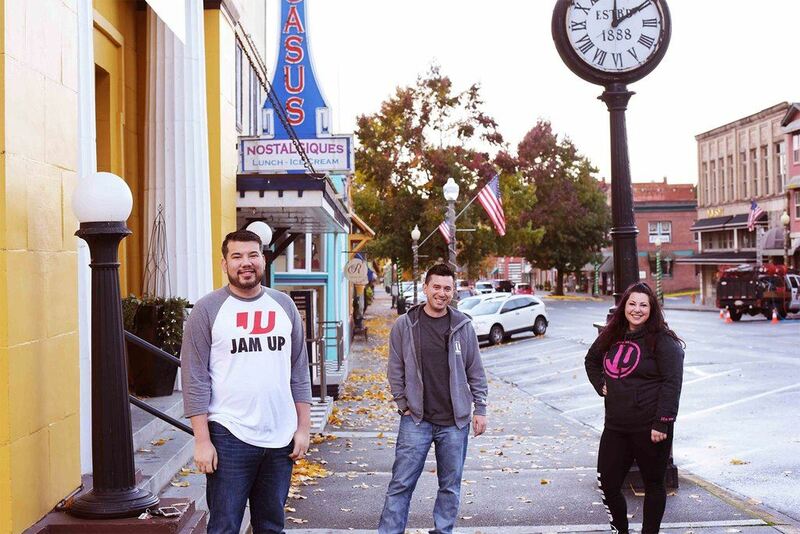 With the brilliant assistance of accomplished designer Mindy Pongpanik, Damian’s wife, Jam Up Apparel delivers to the pool community as well as the rest of the competitive world, what it means to reach the top and be considered Jam Up. The Florida Junior State 9 Ball Championships took place February 17, 2017, at Park Avenue Billiards, Orange Park and contained many surprising twists and turns. This year the tournament utilized one bracket for all of the 18 and under boy’s divisions. The Junior National Championship qualifying spots then went to the highest placing 18UB and highest placing 14UB. The event had participants from S. Daytona, FL, Plant City, FL, Tampa, FL, Jacksonville, FL, and all the way from Greenville, SC! There was a total of 9 players participating; 6 18UB and 3 14UB. They all played at a high level. Trenton White was sent to the 1 loss bracket early on, however, he fought his way back to take 3rd place in the tournament and won the 14UB National Qualifier! In another turn of events, Parker Huggins, from Greenville, SC sent Logan Hultz to the loser’s bracket and claimed the hot seat. Logan won the right to come back and play a grudge match against Parker for the National spot. Both boys competed very well. Parker went undefeated and won the 18UB National Qualifier. On The Wire Creative Media (OTW) is proud to announce a partnership agreement with The Billiard Education Foundation (BEF). As the marketing manager for the BEF in 2018, OTW's charge will be to engage members, capture new followers and grow the number of supporters worldwide, goals which will be achieved by distributing interviews, free live streams and upcoming BEF events thru Facebook, Instagram and the BEF website. Both the BEF and OTW are invested in supporting the kids through billiards education and instruction; promoting billiards as a positive way to learn life skills, developing and facilitating billiard programs and competition at all levels and providing academic scholarships. "We are thrilled to have the opportunity to work with On The Wire Creative Media,” said BEF President Tom Riccobene. “Beau and Ra are committed to all the BEF stands for and this partnership will help us to do what we do to help these great kids. Each and every one of our juniors deserves to be recognized for their individual work and achievements. Working with OTW is a blessing to the BEF." "The BEF is where billiards begins, I love this organization," said Beau Runningen of OTW. "Surround yourself with the right people and great things will happen. This partnership is from our hearts," added OTW’s Ra Hanna. "We are very excited about our relationship with the BEF, the BEF is close to our hearts." On The Wire Creative, based in Pasadena, Calif., has been making quite a splash in the pool world over the last few years, predominantly due to their viral on the spot reporting, live stream videos and tournament promotions. 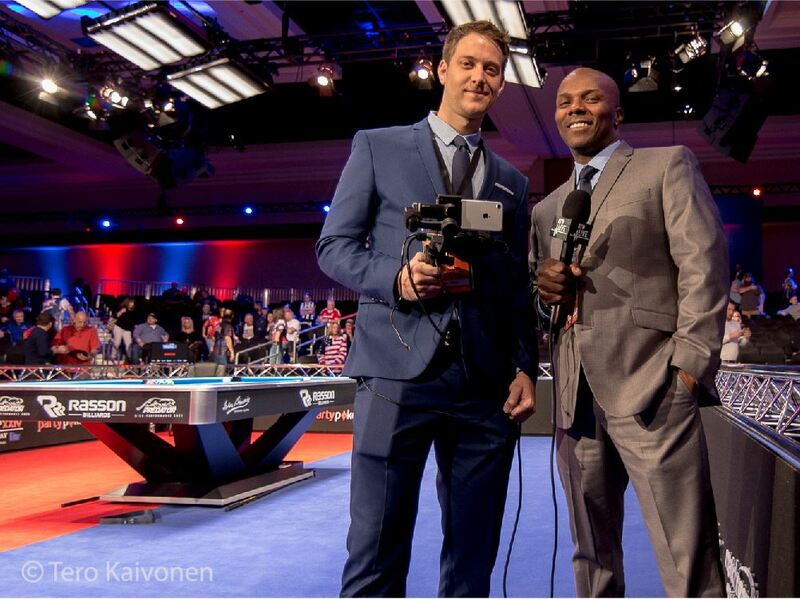 OTW has become a highly sought after choice of professional pool in America and were the official live streamers of the 2017 Mosconi Cup held in Las Vegas. The Billiard Education Foundation was established to ensure that all juniors in the United States have opportunities to play and compete. The BEF's mission is to develop a lifelong love of billiard sports in junior players by supporting billiard education and instruction, promoting billiards as a positive way to learn life skills, developing and facilitating billiard programs and competition at all levels and providing academic scholarships. The most respected, skilled and academically brilliant minded junior cueists from across the United States were just in Vegas competing in an action packed week of billiards. A few miles south of the Vegas strip the Billiard Education Foundation (BEF) had presented and concluded the 29th Annual Junior National 9-Ball Championships. This challenging co-event was held Wednesday-Saturday August 2nd- 5th, 2017, having returned to the family friendly South Point Hotel, Casino & Spa in Las Vegas, Nevada. Showcased at one end of the Billiard Congress of America (BCA) Billiard & Home Leisure Expo was the BEF junior national’s arena. The competition area boasted 20 professional 9-foot Diamond tables. This junior event is the only opportunity for U.S. billiard student-athletes to qualify to compete at the World Pool-Billiard Association (WPA) World Junior 9-Ball Championships being held this year Oct 31st – Nov. 5th, 2017 in Moscow, Russia. On Tuesday, the registration process was in full motion with the noise and bustle of last minute preparations for the tournament and expo grand openings. There, the junior players received BEF sponsor gifts and a 2017 tournament memorabilia shirt. The junior events kicked off that evening with the highly anticipated and popular annual Adult-Youth Scotch Doubles tournament, which gave parents and juniors the chance to showcase their skills for a doubles fun-filled night and prizes. Even the pros were actively seeking to be recruited to fill in and play. BEF Tournament director Earl Munson remarked, “Big grins everywhere. The pros were playing like kids and the kids were playing like pros!” BCA Hall of Famers and multi world champions Nick Varner & Loree Jon Hasson along with Mosconi team USA and doubles silver medalist in World Cup of Pool, Skyler Woodward & Shane Van Boening joined with the junior players. Former 2002 junior national champion Beau Runningen was eagerly paired and proved he still had game, and fellow 2017 Team USA member Manny Perez matched up as well. Parent’s skill levels ranged in doubles competition from yikes (Where is the instructor quick? ), to wow (Did you see that parent play?!). Eventually the fun night ended with all the pros/junior teams converging to the semi-finals. 1st Place was Skyler Woodward & Trenton White, 2nd Place Nick Varner & Justin Toye, 3rd Place Loree Jon Hasson & Xavier Hultze, 4th Place Beau Runningen & Spencer Ladin. Wednesday, the players meeting and group photo opened the 3 pm start of the first five rounds of the 2017 BEF Junior National 9-Ball tournament. This year’s tournament format incorporated the WPA World Junior style of preliminary double elimination brackets qualifying to a seeded single elimination finals bracket. The format also allows for the larger fields sizes, table and time constraints. This year’s field represented: 167 players, ranging from 7 to 18 years of age, from over 30 qualifying events, more than 25 states and including the U.S. Virgin Islands. There were four participating divisions included 18 & Under Boys (18UB), 18 & Under Girls (18UG), 14 & Under Boys (14UB) and 14 & Under Girls (14UG). The divisions played in 64, 64, 32 and 32 double elimination brackets respectively. The top 25% of players from each division then moved to single elimination brackets with the winners seeded and the one-loss players listed by a blind draw. Without a doubt match play all week was exciting and intense as all players vied to make it to their respective finals single-elimination brackets. On Friday night before the finals, the packed banquet night was held. The banquet comfortably seated all juniors, family members, pros, sponsors, and BEF staff and volunteers to enjoy a great meal, laughs, heartfelt speeches, recognitions, remembrance, awards and honors. Each year players are nominated by their peers at the junior nationals to recognize sportsmanship on and off the table. This special award is in remembrance and recognition of one of BEF’s alumni’s, Brendan Crockett, who was more than just a talented young player taken early from life. Brendan grew from an eager teen-ager to an intelligent, charming gentleman with true character and humility. His humor, willingness to work hard and ability to lead have been an important part of our programs. The 2017 Brendan Crockett Character Award Recipients were: Eric Roberts from Crossville, Tennessee and Eliana Rodriguez from Brooklyn, New York. The Special Guest Speaker at the banquet this year was “The Colonel”, Nick Varner. He humorously recounted his junior moments in the game and he jokingly had some great advice to share. “If you bet twice as much, you will learn twice as fast.” Varner has long been an enthusiastic supporter of the juniors and also stated, “This event is amazing and a great showcase of our (nations) top junior players”. Newly inducted 2017 BCA Hall of Famer Tom “Dr. Cue” Rossman also made his 24th appearance at the junior nationals. Dr. Cue, presented the 2017 Artistic Pool awards to this year’s champions, Timmy Bly (Bettendorf, IA), Michelle Jiang (Harvard, MA), Joey Tate Raleigh, NC) and Lana Keith (Dyersburg, TN). The banquet night again amassed much of the junior field with the coveted title of “Academic All American” (AAA) when awards were presented. Of the entire 167 player field, an incredible 45% of this year’s participants (75 players!) earned school GPA’s of 3.5 and 31.6% of the AAA field earned 4.0 GPA’s, to receive recognition! The sport of billiards is definitely attracting, developing, and maintaining academic excellence! The banquet concluded with words of optimism and change from longtime BEF Trustee Tom Riccobene, “Each of us can take home what we have learned here this week and share with the people we love and meet. You’re all champions and we are honored to learn from you”, Riccobene said. The finals play for all divisions was held on Saturday Aug. 5th. In an effort to stay more aligned with the WPA World event, the BEF awarded Gold, Silver and Bronze medals to the top four finishers of each division. All medalists in the 18UB & 18UG divisions along with the gold and silver medalists from the 14UG & 14UB divisions have been nominated for the 2017 WPA World Junior 9-Ball Championships October 31st to November 5th in Moscow, Russia. This junior national was a year of competitive upsets. A trio of past back-to-back champions made up of Nathan Childress (14UB from North Chesterfield, VA), April “The Grinder” Larson (18UG from Bloomington, MN), and Ashley Fullerton (14UG from Lake Park, MN) all sought to become three-peat champions but fell short and all new gold medalists emerged. Larson drew a bye sliding her to the winner side where she then matched up and defeated Katelin Ballou and then Abigail Reese to move her to the 18UG finals 8 bracket. In the semifinals match April was determined to move on but rival Michelle Jiang from Harvard, MA ended her bid to claim her 3rd straight 18UG’s title earning Larson a bronze medal instead for her effort. Gracie Davis from Decatur, IL with her great play also joined Larson for the bronze. Jiang battled it out in the 18UG finals match against Alex Booth from Mount Ayr, IA with Jiang excitedly getting her first 18UG gold medal win with Booth taking the very respectable silver. Jiang has been playing very strong the last few months with her now qualifying for her 4th Junior Worlds. Jiang will head to Moscow, Russia with her fellow Team USA members on Oct 31st, 2017. In the 14UG division it was also a battle to maintain the championship reign, as the 2016 14UG Champion Fullerton from Lake Park, MN tried but failed to make the 14UG’s final bracket losing her first match to Tatum Cutting from Diamond, OH and her second to Vivian Liu from Harvard, MA. Liu and Cutting would eventually become opponents in the bronze medal round where Liu moved on leaving Cutting with the bronze. Gracie Davis from Decatur, IL matched up with Savanna Wolford from Troutville, VA in the other half of the semis with Davis also getting the bronze and earning Wolford a match up with Liu in the finals. The 14UG finals match played at 11am on Saturday spotlighted the two young quiet and upcoming players in Liu and Wolford. Both played well with Liu edging out the win with her first gold medal and Wolford proudly taking home the silver. The title of 18UB champion was newly earned this year by Austin Summers from Metropolis, IL. Summers started out strong winning his first two matches only to come up short against Graham Swinson to earn a spot on the final 16 bracket winner seeded position. Needing only a single match win on the one loss side gave Summer’s his spot on the Final 16 single elimination 18UB bracket. Taking down Lukas Fracasso-Verner in a rescheduled reprieve match due to a disqualification sent Summer’s to play Ricky Evans in the semifinals. Evans from St. Peters, MO was last year’s 18UB champion but Evans struggled to keep Summer’s from finally advancing to gold earning Evans the bronze medal this year. Summers traded wins with Kaiden Hunkins from Waukesha, WI until the match was over with Austin Summers winning gold and Hunkins taking the silver medal for being runner-up in this year’s 18UB division. Thomas Haas from Lancaster, PA also took the bronze medal losing in the semifinals to Hunkins. As always the 14UB’s is a very competitive division with high levels of play even for that age. As in the 18UG and 14UG, defending national champion Nathan Childress from North Chesterfield, VA was chasing his third consecutive championship. But Childress ran into a wall this year from a veteran BEF tournament player from Crossville, TN named Eric Roberts. Roberts knocked the defending champion, in a resounding statement of 6-0, to the one loss side where they would again meet up on the blind draw of the 14UB finals bracket. Again Roberts took Childress out this time for good with another convincing 6-2 win. Roberts would go on to win again in the quarterfinals against Jayden Liu from Harvard, MA only to eventually lose to Joey Tate from Lake Villa, IL in the semifinals earning Roberts his first medal ever with the Bronze. The very skilled Gabriel Martinez from New Braunfels, TX also earned a bronze medal after Joshua Shultz from Stedman, NC defeated him. Shultz earned a finals match with Joey Tate. Tate with 2X Junior Worlds experience under his belt was at an advantage in the high- pressure match for the gold with Shultz. After the last 9-ball was pocketed for the match wins the entire five-players strong Tate family, applauded with joy as their brother was crowned the BEF 2017 14UB Gold Medal Champion and Shultz as runner-up Silver Medalist. The future is very bright for our BEF junior program members as there are now more than ever before, so many high level competitive opportunities at the local, state, national, and international level. The Billiard Education Foundation proudly recognizes the industry leaders who helped make this year’s event possible. Event Sponsors: Billiard Congress of America. Diamond Billiard Products, TLP Billiards, Simonis, Aramith, Ultimate Team Gear, Jacoby Cues, On the Wire Creative Media, Pechaur Cue, ACS, Champion, Valley, Dynamo, Connelly, FCI Billiards, McDermott, Predator, OB Cues, DigiCue, Presidential Billiards, West State Billiards, OGB Millwork, Professional Billiards Instructor Association, Master Chalk, Tiger, Presidential Billiards Pool & Billiard Magazine, Professor Q Ball, Billiards Digest, AzBilliards.com, Dr. Cue, Billiard University, Dave Alciatore, Bob Jewett, Brett Lewis, Jay Helfert, Jeremiah Gage and Tom Riccobene. The BEF gives special thanks to all the individuals who gave countless hours throughout the year to help make this event possible: Samm Diep-Vidal, Tom Riccobene (BEF Treasurer), Jeremiah Gage (BEF Secretary), Shari Stauch (BEF President), Tammy Jo Leonard (BEF Assistant National Director), Earl Munson (BEF Tournament Director) received the 2017 BCA Presidents Award, Rick Doner (BEF Head Referee), Justin Ballou (Assistant Head Referee), Ed Smith (Referee), Ed Stephens (Referee), Angela Williams (Referee), Dennis & Doris Stotler (Referees), Jim Ladin (Volunteer/Donor), Corey and Trena Wolford, Stephanie Shaw (Volunteer), Steve Strange(volunteer), congratulations to the new 2017 BCA Hall-of-Famer “Dr. Cue” Tom Rossman (Junior Artistic Pool Championship Director), Nick Varner (Pro Guest Speaker), Ra Hanna & Beau Runningen for providing live streaming/scoring/brackets through On The Wire Creative Media and pro commentary by Loree Jon Hasson and Max Eberle, Brian Glasgow and his professional team, all the staff at South Point and a huge thanks to BCA’s Rob Johnson, Chance Pack, and Shane Tyree for all their help and support, and to all the parents and juniors who are so dedicated to the sport we give a hearty thank you and we will see you next year in New Orleans. The BEF was formed in 1993 as a 501(c)(3) nonprofit charity, committed to promoting a lifelong love of pool and building the next generation of players through youth programs and academic scholarships. Visit billiardeducation.org or call (303) 926-1039 to learn more about junior billiard programs in your area.